Launch: --Very shallow so it would have been difficult to get our C-Dory off the trailer. 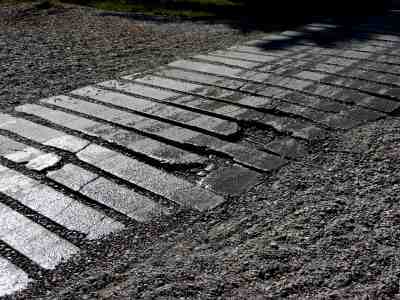 Ramp is in bad shape with holes and breaks in the concrete. Nearby campsites: --There are four campgrounds around the lake. One, at Apgar Visitor Center is the only one with a boat ramp, we were told. 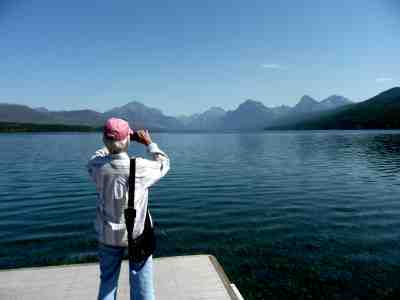 Comments: --Glacier National Park is not savvy to the needs of power boaters. 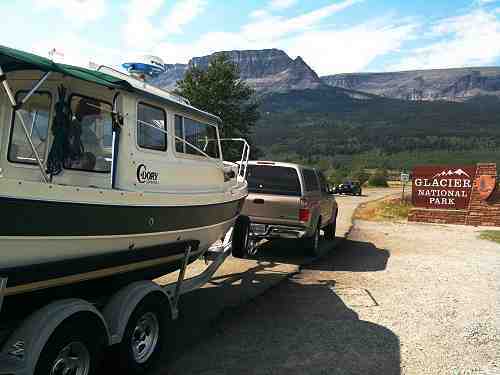 We found most rangers had little or no knowledge about the use of power boats on our Glacier Park Lakes. It seemed that the Park Service in Glacier NP was 'in the hands' of the commercial boat operators so the public owners of the park are discouraged (by neglect) from bringing their boats to the lakes They have much to learn from Grand Teton NP. 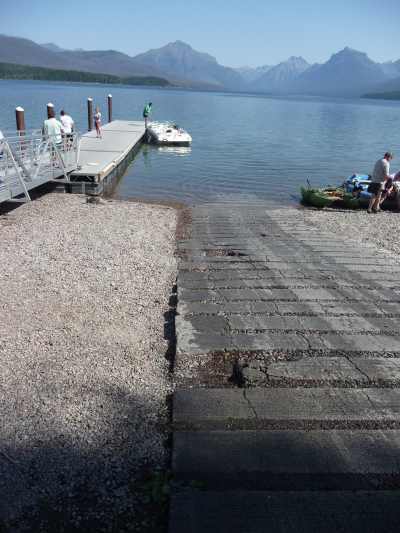 ------ We were warned by Phil, a local boater we met on Flathead Lake, that Lake McDonald had an iffy boat ramp and that we might want to give it a miss. Since it is but a few miles from our last cruise on Hungry Horse Reservoir, we drove over to the West Side of Glacier to check it out. Phil was right. It is a pretty lake, but the ramp is iffy. ------ We saw a ranger, so asked her if we could overnight on the lake. "Nope,"she told us we could not anchor out over night so any cruise must be a day trip. There are back country campsites on the lake so we asked her if we could apply for one of those, and simply anchor off the site and this would give others a chance to use the land site and our living on the boat would have less environmental impact than if we were ashore. "Nope. No overnighting on a boat on the lake," the ranger emphatically said. ------ "OK, how about our anchoring the boat offshore and we'll camp in the back country campsite. Will that work?" ------ "No one ever requested that before - but I say, 'no,' since that would keep the boat on the lake overnight." And with that she turned her back and walked off. ------ So, that ended the discussion. ------ We looked at the lake and decided that the ramp was in such bad shape that we wouldn't risk launching simply for a day cruise. ------ Consequently, we headed over Marias Pass to check out the eastside lakes. Oh, the memories we have of Marias Pass. Years ago, with our daughter Kim, we took AmTrak to Essex (then a whistle stop on the main Empire Builder route) in late December. We hopped off, stayed at the railroad hotel, rented cross country skiis and had a great time skiing beside the track and on a few trails. We skiied into a moose on one trek and El and Kim skiied into an avalanch shed that covered the track like a tunnel - only to meet a westbound freight. They raced out ahead of the slow moving uphill train, much to my laughter - "Warned you," I shouted and was rewarded with a hail of snowballs.